Traditional signature-based antivirus is obsolete. 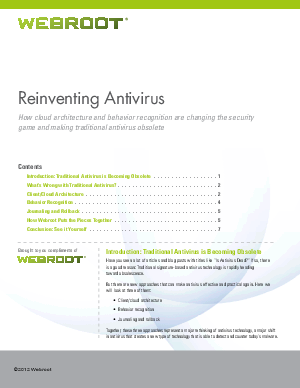 But there are fresh new concepts that can make anti-malware effective again. This paper discussed three of them.Together, these approaches can improve performance, detect a far wider range of malware and dramatically reduce the time systems administrators and support staff spend distributing signature updates and cleaning infecting systems.